The story begins right at the cover with Musk Ox chomping on the apple that would have been what “A” stands for. Instead, he insists that A is really for musk ox. Zebra argues with him, after all there isn’t even a single letter A in musk ox. Musk Ox explains using lots of words that start with “A” that musk oxen are Awesome; they live in the Artic and even Alaska. Turn the page and you will see that B is also for musk ox, rather than baby. Again, Musk Ox has plenty of explanations for exactly why. This silliness continues through the book, forming a pattern until you reach the letter M. And I don’t want to spoil the surprise, but I bet you won’t guess what M stands for. This zany book is filled with humor, pure cheer and a jolly spirit. This is not an alphabet book for those first learning their letters. Instead, children who know how the alphabet works and who are veterans of ABC books will enjoy it most. They will get the jokes that are being poked at more normal alphabet books as well as the more pointed humor of the storyline. Cabatingan’s writing, done entirely in dialogue, is a pleasure to read aloud. It has a natural flow and a great sense of timing. Myers’ illustrations are simple and quite silly when called for. The personalities of the two characters come across in their body language. A hilarious alphabet book that is guaranteed to get kids giggling. Appropriate for ages 5-7. The second Beautiful Creatures trailer has been released. The movie is coming in February 2013. 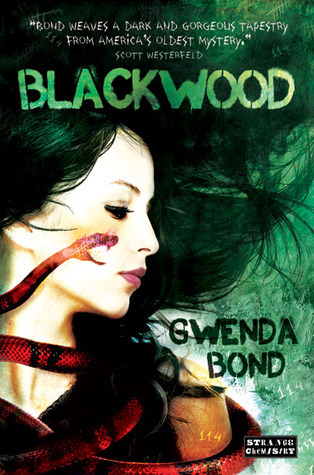 The movie rights for Blackwood by Gwenda Bond have been purchased. MTV is developing the film to be produced by Kelsey Grammer.